Arduino pulse sensor is quite commonly seen in various example projects using the typical sensor first made by pulsesensor.com. The sensor has a positive connection, a negative connection and an analogue data pin. It is quite easy to connect it with Arduino. pulsesensor.com has lot of examples and library of codes. For Mac, they have an app too. Pulse sensor module is important cheapest biomedical module. It is actually not sensitive, however basic can be learned through it. Pulse Sensor itself not digital, it is not interfacing through I²C or something similar protocol. It provides an analog value from 0 to 1023, pointing infrared the light sensor is receiving. When we place our finger between the IR LED and the light transistor of the sensor, as heartbeat dilates the blood vessels, it filters the light in pulsating manner. If the tide is properly calibrated then it may be enough sensitive. You’ll get plot with arbitary analogue value. // The rising flag prevents us from detecting the same rise more than once. With the above example, we given the example how really the thing works. Plotting only heart rate has not much value, yet it is good to test biomed project. This Article Has Been Shared 8548 Times! Graphical LCD Actually Practical Over 16×2 LCDs. Here is Graphical LCD (GLCD) Buying Guide For Arduino as There Are Matters to Know Like Drivers. Here is a Basic Arduino Oscilloscope, Which Will Show Plotting on Serial Plotter of Arduino Web IDE and Analog Inputs Work as 6 Channels. 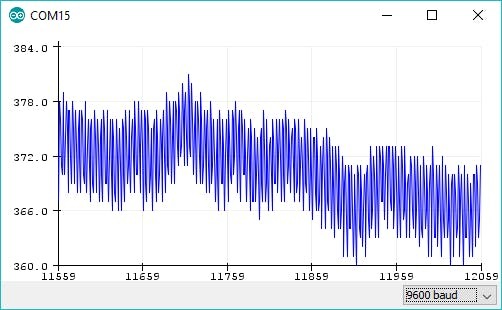 Cite this article as: Abhishek Ghosh, "Arduino Pulse Sensor and Heart Rate Plotting," in The Customize Windows, January 16, 2019, April 21, 2019, https://thecustomizewindows.com/2019/01/arduino-pulse-sensor-and-heart-rate-plotting/.